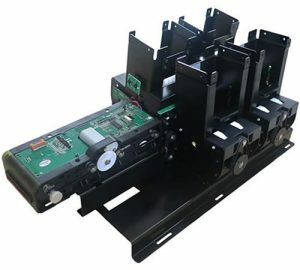 MTK-F53 is a 4-tray card dispenser features easy customization and integration with motor card readers, card channels and printers etc.. With extended motor card reader integrated, the dispenser is capable of decoding magnetic stripe, contact or contactless smart cards. Alternatively with open channel extended, the motor dispenser gains the flexibility to add barcode scanners or third party RF readers. 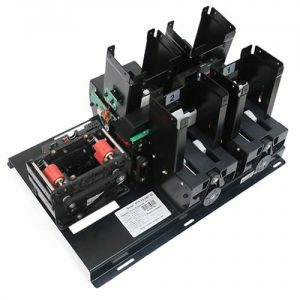 The customized MTK-F53 card dispenser integrates its self-owned MTK-A6L motor card reader or MTK-F21 card collector seamlessly which makes it easy for development and upgrading. With the extensions available, MTK-F53 functions extensively for vending various bank cards, SIM cards or top-up cards in various self-service kiosk machines.